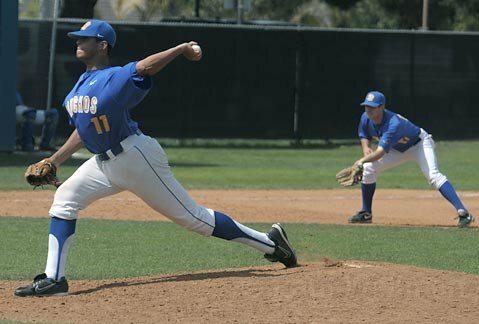 Pre Draft Report: Mario Hollands pitched collegiately at UC-Santa Barbara. After a redshirt season, he was named the Big West Freshman Pitcher of the Year and was a national freshman All-American in 2008. He had an up-and-down sophomore year that was all downhill after he took a comebacker to the groin. He ended up getting picked in the 24th round by the Twins but didn’t sign. Hollands pitched in the Cape Cod League in the summer of 2009 and put up a 2.12 ERA. During his senior season, Hollands was twice named the Big West Pitcher of the Week, twice named the National Pitcher of the Year, and tied a school record with a 16 strikeout performance. Hollands reportedly added 15 pounds between his sophomore and junior seasons, which resulted in a fastball that had been sitting at 87 and topping out at 89 to sitting at 90 and topping out at 93. His slider moved into the 84-85 range and all of his secondary stuff was working and he was able to throw all of his pitches for strikes consistently. Heading into the 2010 draft, Hollands was ranked 50th in California by Baseball America, which noted Holland’s five-pitch assortment, including an 88-91 mph four-seamer, 83 mph two-seamer, curve, slider, and change. It also noted that he was prone to the occasional big inning which was almost always attributable to a loss of mechanics including dropping his arm slot and losing his leg drive. The Phillies signed Hollands immediately after the draft and sent him to Williamsport to start his pro career. Career Synopsis: Hollands made 14 starts for Williamsport, pitching 65 innings. His rates were good across the board: 8.7 K/9, 2.2 BB/9, 3.94 K/BB, 8.7 H/9, and 0.8 HR/9. His 4.57 ERA seems high given the component rates, although his FIP was much better at 3.25. Following the season, Hollands participated in the Florida Instructional League. Summary: Hollands is kind of strange. He doesn’t have overpowering stuff, but hes been a reliable pitcher throughout his college career, and generally stays around the plate. If his fastball sits at 90-93 as a pro he’s a legit 50/55 arm strength guy, but he was 87-89 for large chunks of his college career, so I want to see more here before coming up with a definitive arm strength grade. That will serve him well as a pro, as he will need to show above average command and control to make it as a back end starter or middle reliever. His fastball plays up because of the deception in his delivery, but his secondary offerings are fringy. He’s been durable in college, which is probably his best asset at this point. His mechanics look strange, but its tough to say they are below average when they haven’t led to control or injury issues. Upside: Hollands physically resembles David Price at 6’5” and is reportedly at least 15 pounds heavier than his listed 205. His stuff is nowhere near Price’s, but he nonetheless has a good repertoire of 5 pitches and while his fastball is not overpowering, it has movement. He’s generally a strike-thrower, although as noted above, he has occasional mechanical issues that will lead him to periods of wildness. Hollands likely projects out as a #4 or #5 starter (or possible bullpen arm). He should start the season in Lakewood, but like some other recent college draft picks, might be able to move quickly and become a legit prospect, albeit one with a relatively low ceiling. You have to fast forward through his interview, but there are brief clips of him pitching. He has a really funky delivery, dropping down and coming almost from the side, with a lot of herking and jerking going on. This helps create deception, but can also hinder his command and control when he is out of sync. He gets decent extension to the plate, and though his delivery looks unconventional, his arm seems to work decently well. I am so proud of Mario Holland ‘s success thus far. I taught Mario Holland in Kindergarten in West Contra Costa School District in Richmond, California. I am retied now after teaching 42 years but I will follow Mario when the Phillies ply the Giants.